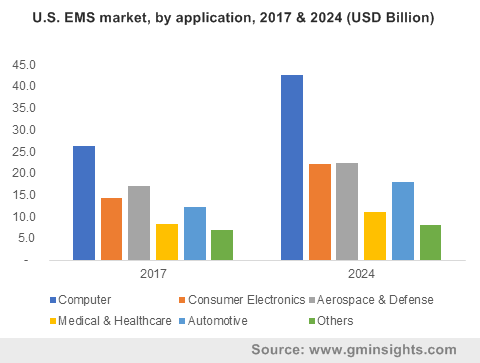 Owing to the surging demand for consumer electronics, measurable devices, industrial automation, and medical devices, electronic manufacturing services (EMS) market has been observing a considerable growth momentum lately. EMS market players have been witnessing rapid product demand that has been encouraging them to implement revenue generating business strategies. In fact, within the last few years, numerous companies have invested vigorously to acquire rival production facilities, to expand regional facility centers and improve serviceability. The continuously expanding electronic manufacturing industry across the globe in line with the rapid digitalization is poised to impel the electronic manufacturing services (EMS) industry size. Recently, renowned electronic manufacturing services provider, SMTC Corporation completed a USD 5 million investment in terms of equipment and facility expansion across North America. Further, the company also announced that it has received an advance order of USD 15 million from the new customers. SMTC has thus successfully upgraded its capacity and has improved its product quality by doubling the box-build manufacturing capacity. SMTC’s smart tactic of retaining focus on the customers’ requirement for strengthening its position in the EMS industry has thus helped it to emerge as a leader as far as flexibility and manufacturing excellence are concerned. Of late, issues related to the material supply have been threatening the companies in the electronic manufacturing services industry. In this regard, to ensure the continuous accuracy for material allocation, completion of planned worked orders, spoilage, and accountability of the end product, most of the electronic manufacturing services industry companies have been deploying new software technologies at their workplaces. The integration of automation and smart technologies are proving to be rather beneficial for these firms. Indeed, the shifting focus of the companies toward the adoption of smart manufacturing practices has been helping them meet their customers’ requirements and expectations, that have been registering a pinnacle of change lately. Recently, in order to deal with the material supply issue, EMS provider based in Italy, Elettronica GF decided to deploy Aegis Software’s digital MES (manufacturing execution software) platform. With the deployment of this digital platform, Elettronica GF will significantly promote accurate and fast material procurement for flexible manufacturing. The surging use of intelligent and software interfaces to support decision making at the company is thus poised to propel electronic manufacturing services (EMS) market share. Taking into account the fast-moving growth pace of the overall electronics industry, players in the electronic manufacturing services market have been looking forward to acquiring the facility centers of their rivals. The implementation of such tactics has been helping them achieve an ambitious market position. Validating the aforementioned fact, recently, Denmark’s largest electronic manufacturing service company, GPV, acquired the Swiss-based EMS company CSS. This acquisition has helped the Danish company to expand its presence across North American, European, and Asian continents. In addition, GPV is aiming to strengthen its customer base by improving its product set-up and delivering small and medium-sized series. The tremendous potential of EMS providers to deliver high-end services to their customers will thus have an extensive influence on the electronic manufacturing services industry growth over the years ahead. Speaking along the same line, Kimball Electronics, Inc., in a bid to harness EMS for multifaceted manufacturing solutions has purchased all the assets and liabilities of Global Equipment Services and Manufacturing, Inc. and its subsidiaries. This acquisition will open up new business opportunities for Kimball Electronics, Inc. owing to the widespread technology portfolio of GES in automation, test, and measurement. Additionally, for achieving the global success in electronic manufacturing services market, Kimball is planning to implement a new platform strategy as well, over the years ahead. The steady demand for EMS across numerous industrial sectors will thus considerably encourage electronic manufacturing services market players to improve their product sales in the future. The development of adequate software solutions and enhanced abilities of EMS companies to expand their product offerings will also help major companies gain competitive benefits. Aided essentially by rapid technological transformations, electronic manufacturing services (EMS) market will surpass revenue collection of USD 650 billion by the end of 2024.